The Ardmore Development Authority helps site selectors find data and information about Ardmore, Oklahoma and our pro-business outlook. Ardmore has been listed as #1 on the list of "Best Places to Start a Business in Oklahoma" on nerdwallet.com. The Ardmore Development Authority offers a single point of contact for information, proposals, planning, and site assistance. The ADA owns three industrial parks and several single sites and buildings, giving our organization both the power and incentive to negotiate favorable terms for expanding companies. Factor in Oklahoma’s right-to-work status and a host of business incentives, and you’ll simply get more in Ardmore. The cost of doing business in Ardmore, Oklahoma is significantly less than most of the nation. Low construction costs, utility rates, overhead, housing costs, and taxes make Ardmore a highly desirable business location. View our utility company contacts. When you get more and save more, you earn more. New and expanding companies often tell us that locating in Ardmore, Oklahoma was one of their best business decisions. "Michelin Ardmore and the Ardmore local community are inextricably linked – the success of one being that of the other reciprocally. That’s why we are fortunate to have an organization such as the Ardmore Development Authority driving progress for the community and its stakeholders." Ardmore, Oklahoma is ideally situated between 2 major metropolitan areas – Dallas and Oklahoma City. Our location makes Ardmore the logical choice for distribution, warehouse, and manufacturing operations. Interstate 35 runs directly through the west side of Ardmore, providing easy north-south access for travel and shipment of goods to the central section of the country, as well as Canada and Mexico. Learn more about the highways, railways, and airports near Ardmore. 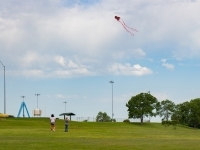 Public and private funding alike create a sense of community spirit and pride, easily seen in the many public parks, performance and sports centers, memorials, and holiday displays that enhance life in Ardmore, Oklahoma. The Goddard Center for the Visual and Performing Arts stands today as a testimonial to the dream of Ethel McClure Goddard, Ardmore educator and librarian. 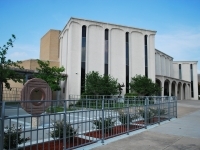 Dedicated to the memory of her husband, Charles B. Goddard, the Center provides Southern Oklahoma with a vital cultural complex serving theatre, dance, music and visual art. 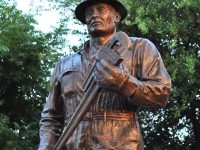 The Oil Patch Warrior and Memorial Square welcomes visitors to downtown Ardmore, standing in silent tribute to the energy industry and to the veterans who fought for the American freedom we enjoy today. Football is big in Oklahoma. And in Ardmore, civic pride is big as well. During the late evening of a crisp, Ardmore autumn you can hear the roar of 4,500 screaming Ardmore Tiger Football fans, cheering their team to victory in the Noble Stadium. The 45,000 sq. ft. convention center was complete in the summer of 2004. For a city the size of Ardmore, Oklahoma the convention center is a remarkable achievement. Ardmore Regional Park is the gem of our city park system. Here you can find a lake, disc golf, a softball complex, hiking and jogging paths, a skatepark, and playground equipment for the young. Listed in the National Historic Registry, Ardmore’s popular Dornick Hills Golf & Country Club is one of the oldest and most prestigious clubs in Oklahoma. 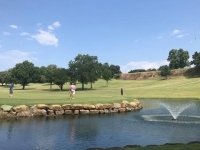 It boasts the first Oklahoman golf club affiliation with the United States Golf Association, as well as being the site of numerous tournaments including the Ardmore Open, a PGA tour event, from 1952 to 1954. It is also home to the clubs signature event "The Oilmen's" since 1963, and the premier college event of the region "The Maxwell" for over 10 years. Over the years, the Ardmore Development Authority has been consistently recognized for excellence in economic development.